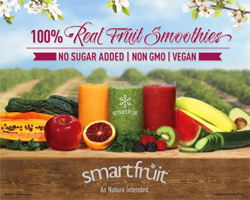 Smartfuit is an all-natural, non-GMO, 100% real fruit puree with no added sugar, no artificial colors, no artificial flavors, no artificial preservatives or additives. Each flavor is enhanced with a unique superfood powerhouse like omega-3, antioxidants, oat fiber, electrolytes, detoxifiers, prebiotics, and other goodies! Smartfruit is VERSATILE! Great for more than just making smoothies, Smartfruit purees can be blended with yogurt into a frappe, served as a juice, mixed with tea, crafted into an Italian soda, or as an ice cream topping! Smartfruit purees are shelf-stable, vegan, gluten free, fat free, and certified Kosher and Halal. Available in ten mouth-watering flavors: Blooming Berry, Harvest Greens, Harvest Reds, Mellow Mango, Perfect Peach, Summer Strawberry, Sunny Banana, Superfruit All-Stars, Tropical Harmony, and Wild Watermelon! Sweet and creamy, salty and smooth, rich and delicious flavor in every bite. This peanut butter is boosted with Flaxseed oil, a naturally rich source of omega-3 so every serving is packed with 400 mg of Omega-3 ALA to promote good heart health as part of a balanced diet.